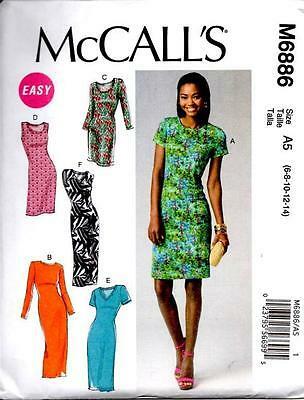 Mccalls 6886: Close-fitting pullover dresses with neckline variations, and stitched hems. Designed for medium-weight moderate stretch knits. Here's another take on Mccalls 6886 that I made for a friend. She was inspired by my Butterick 5672 which was sewn using a novelty print. The fabric for this version is a fun novelty blk/wht print in a stretch cotton with a liquid faux leather contrasting midriff. Never thought I'd find myself slicing & dicing ... however, I made sure to keep flat measuring as I went along. I did cut the back with a center back seam, thinking a zipper would be needed, but it wasn't necessary. Thereafter, construction went seamlessly as I basted the corresponding upper front, middle & bottom pieces first, then the upper back, middle & bottom, shoulder seams and lastly the side seams. The dress seams were serged and its unlined. For the neckline, I did a lil snipping at center front to add a lil somethin' different to the neckline. The neckline, sleeve hems and dress hem were folded 1/2" to the inside and final stitched. She wanted a simple silhouette that she can throw on, top off with a blazer or cardigan and go and Mccalls 6886 is the perfect dress for it. Being a working woman, mom & wife, she needs the ease of simple pieces that will make her mornings hassle free. Of course, I had to make the photo taking and editing fun and switched out the background... she loves it. Adorable, sophisticated dress! She looks great in it and happy too! You're a great friend! What a great idea to add the faux leather mid section. It makes the dress look very on-trend indeed. You are a great friend to sew such a stylish dress for your friend! Very cute! I always seem to wavy stitching when I just fold and stitch a neck hem. Did you do anything extra? Thank you Lisa ! I use to have that issue too. Now, I prefer to stay stitch the neckline, fold hem to inside & with a stitch length @ 2.6 sew slowly. In other instances, I use steam-a-seam and fuse the neckline fold and final stitch with a stitch length at 2.6. Another option, slowly serge the neckline and use that to use as the guide for folding hem to inside & final stitch. Fabrics are so fickle, I find the same technique doesn't always work and use other methods. Hope this was helpful. I love this dress! I really like the addition of the contrasting band. You are a great friend! I will sew for my daughter but not friends! The dress is great and I'm glad she likes it! Thanks Shelia. Those tips were very helpful!! I will try each of them and see what works best. Thanks again!